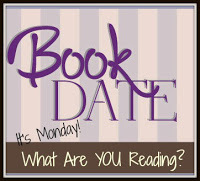 Book By Book: It's Monday 2/11! What Are You Reading? Beautiful white, fluffy snow is falling outside this morning. This is the first of two storms heading our way. My husband hates when it snows, but I grew up in the snowbelt (Rochester, NY), and I like it. It's just right here in Delaware - a few small snowfalls each winter, with some warmer days in between! I'm planning to go for a snowy walk around the neighborhood after I finish this post. Believe it or not, I had more computer problems last week, after my crisis on Monday was resolved. Now, whenever I try to update my iPod, iTunes locks up, I can't connect to WiFi, and everything comes to a screeching halt. Thankfully, restarting seems to reset the WiFi, BUT...this means I have been unable to load any new audiobooks onto my iPod - talk about a crisis! Luckily, I found one still on there that I hadn't listened to yet, but I need to resolve this problem ASAP. I finished my next review book for Shelf Awareness, Before She Knew Him by Peter Swanson, a Booktopia author from last year. I read and enjoyed his thriller, All the Beautiful Lies, last year for the annual event. This one is also a thriller, about a woman who discovers she's living next door to a murderer. The problem is that no one believes her because she has a history of mental illness that once included paranoia and false suspicions. The real suspense comes from the fact that he knows that she knows! I enjoyed this page-turner that's due out on March 5. Next, I turned to one of my TBR books that I've been dying to get to: The Underground Railroad by Colson Whitehead, which won the Pulitzer Prize for Fiction in 2017 and was on every Top Ten list that year. I am so glad I finally got to it because it is just as amazing as everyone said. It's historical fiction but with some fantastical twists added. For instance, the Underground Railroad is a literal railroad underground! Also, each state that Cora, a runaway slave, travels through on her way north has its own unique identity and approach to slavery and race relations. Much of it is chilling and some of it is brutal, but it is also a completely compelling and captivating novel. So, on audio, I couldn't listen to The Blinds by Adam Sternbergh as planned last Monday because I couldn't get it onto my iPod. Luckily, I realized I still had The Devil's Highway by Luis Alberto Urrea on my iPod - I had hoped to read it for Nonfiction November and ran out of time. This works out well because I just pitched a book column to Shelf Awareness for Cinco de Mayo that includes this book (and was accepted by my editor), so I needed to read it anyway. It's the true story of an attempt in 2001 by 26 Mexican men to cross the border into Arizona through a desolate stretch of desert known as the Devil's Highway. It was nominated for a Pulitzer Prize for Nonfiction and is certainly relevant to the immigration controversies and challenges rocking our nation right now. I'm not very far into it yet, but it's fascinating so far. My husband, Ken, is reading a paperback I gave him for Christmas: Edge by Jeffrey Deaver. Though we both love Deaver's Lincoln Rhymes series, this is a stand-alone novel, so we were intrigued by it. He is finally recovered from all his recent traveling, so he's able to stay awake for more than a few pages at a time now! Our son, Jamie, 24, is now reading the FINAL book 14 of The Wheel of Time series, A Memory of Light by Robert Jordan and Brandon Sanderson. This one weighs in at a hefty 1168 pages! He loves this series and has been looking forward to the conclusion. He says this last book is action-packed right from the first chapters, he's down to the last 200 pages, and he's loving it. Middle-Grade Review: The Parker Inheritance by Varian Johnson - mystery, history, and realistic fiction all rolled into one! Graphic Memoir Review: Form of a Question by Andrew Rostan - coming-of-age memoir by a young man who realized his dream of appearing on Jeopardy! Ouch to Itunes playing up when connecting your iPod, must be a computer fault. I love all things Apple, big fan, so hate knowing they are giving you hassles. I like the sound of The Underground Railroad but hate the violence bit, even though I know it happened. So repugnant. I loved Schmidt's Okay for Now, I think it might even be my all time favourite MG book as an adult reader! I like the snow! Well, until mid-February, when I start to look for spring despite knowing full well that it will snow here into April. sigh. Glad you loved Underground Railroad. HOpe your computer issues come to an end. OH NO! I am so so soooo sorry you're still having computer issues. I have become such a lover of Apple over the last two years, so this news hurt me. We used PC/Android for many years and only recently made the switch to all Apple for the entire family and we're all connected on the icloud (we have 3 iPhones, 4 iPods Touch devices for the kids, 2 iPads, 2 iMacs, and 2 MacBooks, though some of this is school-owned). If something goes wrong, then we're ALL in huge trouble!! Okay, you've sold me on The Underground Railroad. I just checked it out on Goodreads and also discovered it's available at BOTH of the local libraries (which really says something since we have such tiny collections). Thanks for all the shares, Sue! Underground RR is AMAZING - you will love it. Ah, see, that's the problem - I don't buy audiobook online - I get them from publishers, so they have to be loaded onto the iPod from iTunes. I did update both the MacBook and iPod systems last night - and that did allow me to update my iPod with a new book - yay! But it's still making my WiFi disconnect...onto the Genius Bar tomorrow - 3rd time's a charm! So sorry I didn't post here yesterday. I opened the window and my son distracted me! The Underground Railroad is definitely, definitely on my list. I am so excited to hear what you think as you continue to read it!!! ha ha sounds like my house! Underground RR is SO good - you will love it. I do love seeing everyone's snow photos, but am glad I don't have to deal with it myself. :-) I must get to The Underground Railroad by Whitehead. It's been staring at me from my shelves for far too long. ha ha my husband would agree with you on the snow, Helen. Same with me with Undergound RR! My husband gave it to me for Christmas LAST year! Definitely move it up your list!